Located on Saltspring Island, BC, Stitches has been a competitive resource for wide range of fibre art supplies since 1998. Their initial focus was on fabric, especially unusual cotton. They also showcased their own completed quilts, wall hangings and and garments, but soon found that customers wanted to create their own items. Stitches then broadened their inventory to include yarn and quickly noticed that there was a crossover between all fibre arts supplies. Today, their store is a one-stop-shop for metals, foils, textiles, paints, quilting supplies and yarns. 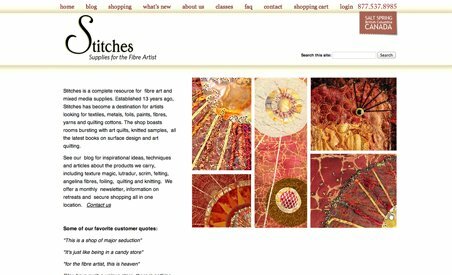 Located on Saltspring Island, BC, Stitches has been a competitive resource for wide range of fibre art supplies since 1998. Their initial focus was on fabric, especially unusual cotton. They also showcased their own completed quilts, wall hangings and and garments, but soon found that customers wanted to create their own items. Stitches then broadened their inventory to include yarn and quickly noticed that there was a crossover between all fibre arts supplies. Today, their store is a one-stop-shop for metals, foils, textiles, paints, quilting supplies and yarns. For those interesting in learning from the experts, Stitches offers classes that focus on different aspects of textile arts. Although their store is not easily accessible, their website allows customers to shop from the comfort of their own home.